A view in Microsoft Dynamics 365 is like a saved query where you can add filters to show the relevant records you require. Once you create the view with your criteria, all you need to do is select the view in CRM and you will see all the records that meet this criteria. Before you create, share or delete views, firstly you will need privileges enabled on the security role assigned to your login. You can set this by going to Settings > Security > Security Roles on the Sitemap. View should have the Read privilege enabled. You will also need to enable privileges in the Saved View in order to Read, Create, Delete, Share or Assign views to another user. Saved View needs to have Create, Read, Write, Delete, Assign or Share enabled depending on the requirement. This is called a Personal View. If you create a view by mistake, you may want to delete this. It’s simple. • If a view has been shared with you, you will also need the delete privilege mentioned in the ‘Share a View’ section below. A personal view can only be viewed by the user who created it but you may want to share it with another user. This will save time in re-creating views. Step 7: Select the relevant user to share the view with and click Add. 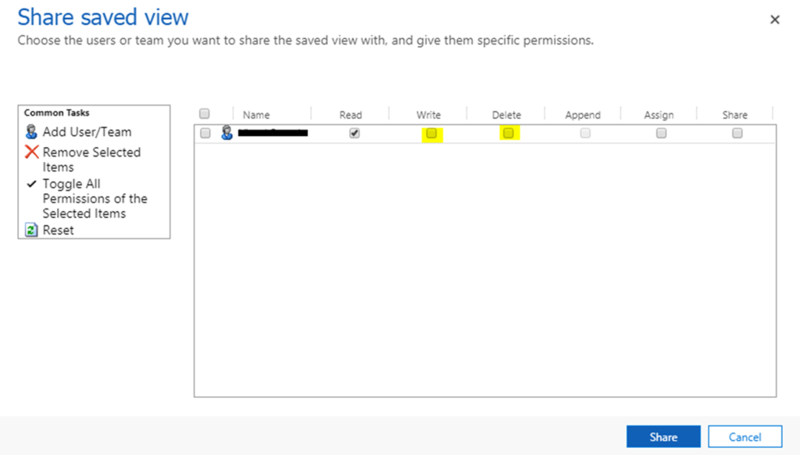 Step 8: You can provide this user to only see the View or you can provide additional privileges to Edit and/or Delete by ticking the relevant boxes. Then click Share. Now when you log into CRM and select the relevant entity, your personal default view will be shown first. I hope this helps in managing your views and make your work easier.